Fairfield Country Day School proudly stands by its mission to provide an educational community dedicated to the personal growth and intellectual development of boys. Our balanced and challenging program is designed to help each student expand his desire and ability to acquire knowledge, stimulate his curiosity and creativity, and enhance his self-esteem for others. Representatives from the faculty and staff, parent body, Board of Trustees, alumni, and past parents gathered to discuss the current state of Country Day, its strengths and weaknesses, and potential opportunities for programmatic growth in the coming years. The Strategic Planning Committee, comprising members of the Board of Trustees and the FCDS administration, refined the ideas generated from these meetings into four strategic priorities: Academic Excellence, Character Development, Marketing and Enrollment, and Long Range Sustainability. The four priorities align with our strategic vision to become the preeminent school for boys in grades K-9 in the region. The success of our plan hinged on the effective execution of the action steps outlined (see plan below). 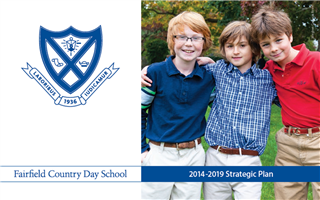 We have enjoyed great momentum as a school over the past nine years and are now well positioned to wrap up the final year of the Fairfield Country Day School 2014-2019 Strategic Plan.